Taipei, Taiwan, June, 2017 – GIGABYTE TECHNOLOGY Co. Ltd, is pleased to announce a new promotion event starting on the June 26th, 2017 until August 31th, 2017. 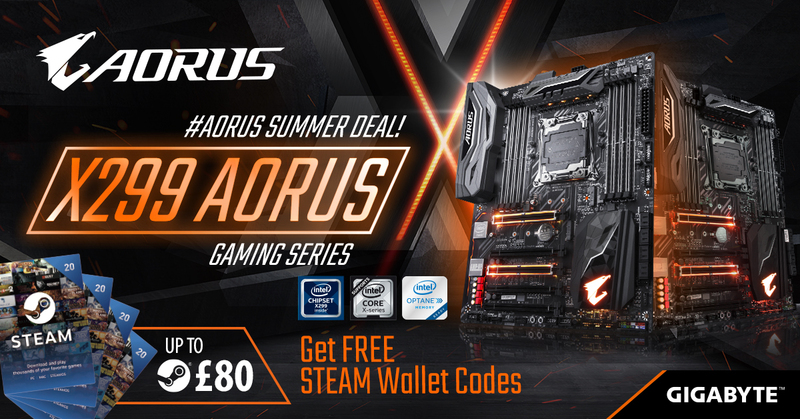 Any one that buys selected GIGABYTE AORUS X299 motherboards will receive up to £80 in Steam Wallet Codes totally FREE! Steam Wallet codes work just like gift cards which can be redeemed on your personal Steam account for Steam credit and used for the purchase of games, in game content, software and any other item you can available in the Steam store. Please note that this promotion is open to residents in United Kingdom and Ireland only.